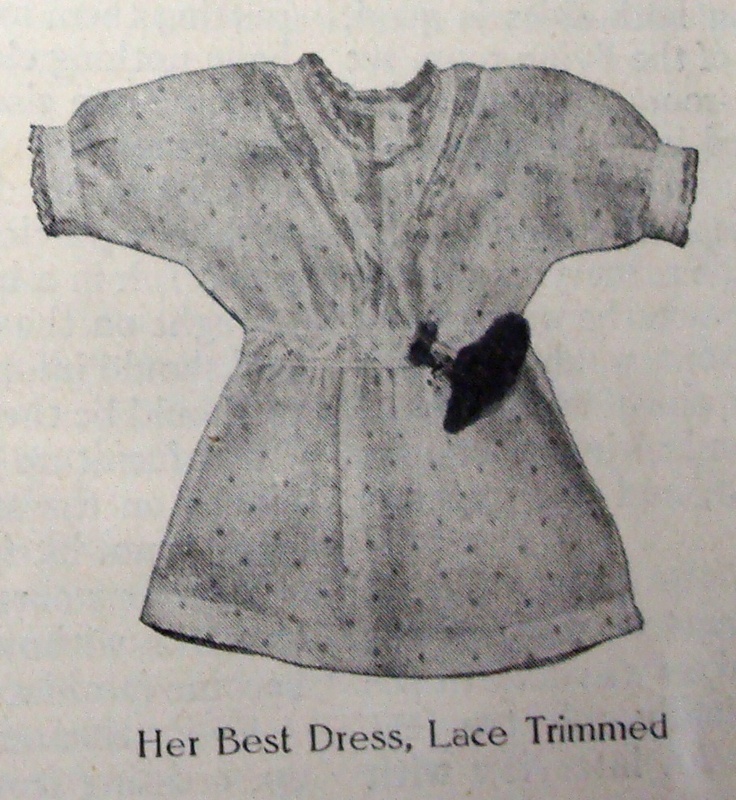 Monday, January 5, 1914: Tried my hand at some sewing this afternoon. Teased my mother. (She simply has to take it, when I get busy.) So passed the afternoon. Took a header on the porch tonight, but managed to go no further than my one knee. I’d love to know what Grandma teased her mother about. In spite of the tumble–Was there ice on the porch?–, it sounds like a good day. Did Grandma sew any seams? 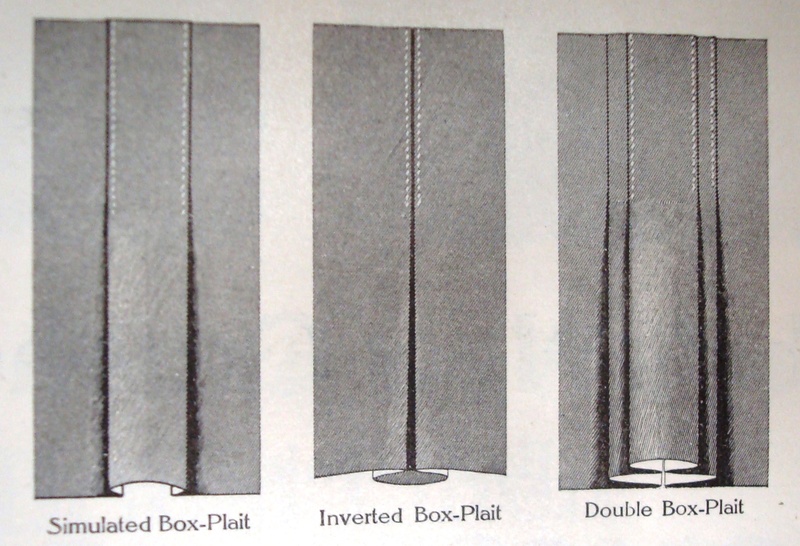 Here’s some hundred-year-old advice for making high-quality seams. When it comes to putting a garment together, many problems face the amateur seamstress, not least among these is the finishing of the joinings. Here is something that needs almost an intuition to solve. Not only do different garments require different finishings but different parts of the same garment require different treatment. Suppose for example you are making a princess slip-on with a flounce. Now for the body seams of the garment you will want something at once dainty and durable, something that isn’t “bunching,” and yet will be strong enough to withstand strain. 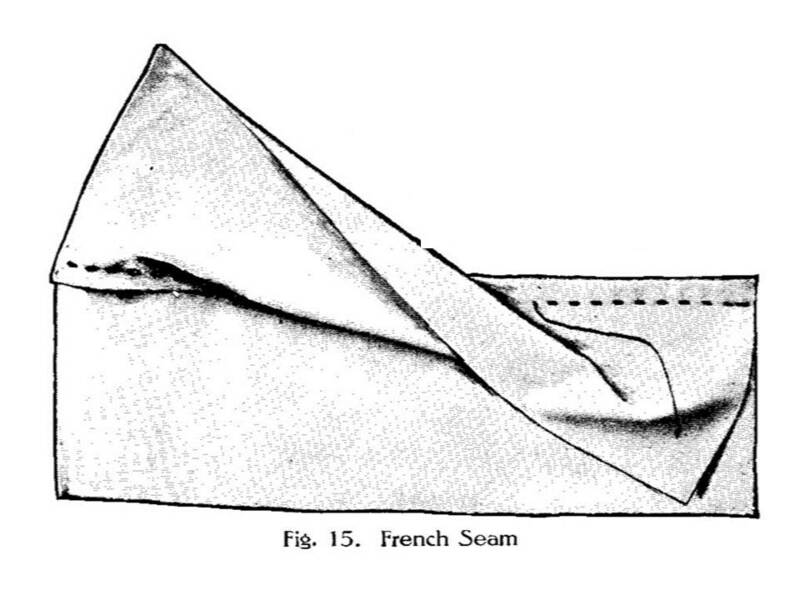 For this then the French seam is best adapted. This you make by joining the pieces with a narrow seam on the right side, then turn and make another seam directly over this on the wrong side. Thus you have the raw edges covered up and have a double sewing to give strength to the seam. The French seam is used also on lingerie waists and children’s dresses, and may be moderately wide or very narrow, according to its place in the garment and the material used. Care must be taken to trim off ravelings before turning the first seam. In making up heavier goods such as a petticoat of sateen, you will find felled seams are the best. There are two different kinds of these. One is made by opening out an ordinary seam of three-fourths to one inch on the wrong side, turn under the edges and sew down. This is a good seam for baby’s night-gowns since it is the least bunglesome. However, it is not so strong as the single felled seam which is made as follows. Allow one-edge of an ordinary seam to extend out about one-fourth inch over the other. Turn a small hem on this and basted down over the other edge and sew firmly. 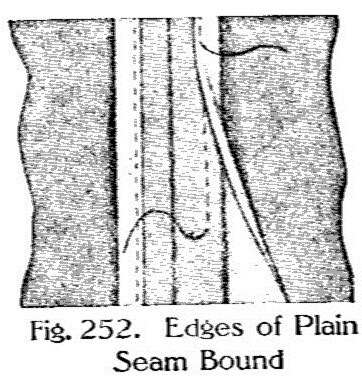 The bound seam is used to finish joinings in dresses or skirts of heavy material and is made by binding the edges of an ordinary seam with seam binding which comes for this purpose. For baby’s flannel petticoats or woolen shirts baste open an ordinary raw seam and feather stitch on the right side. 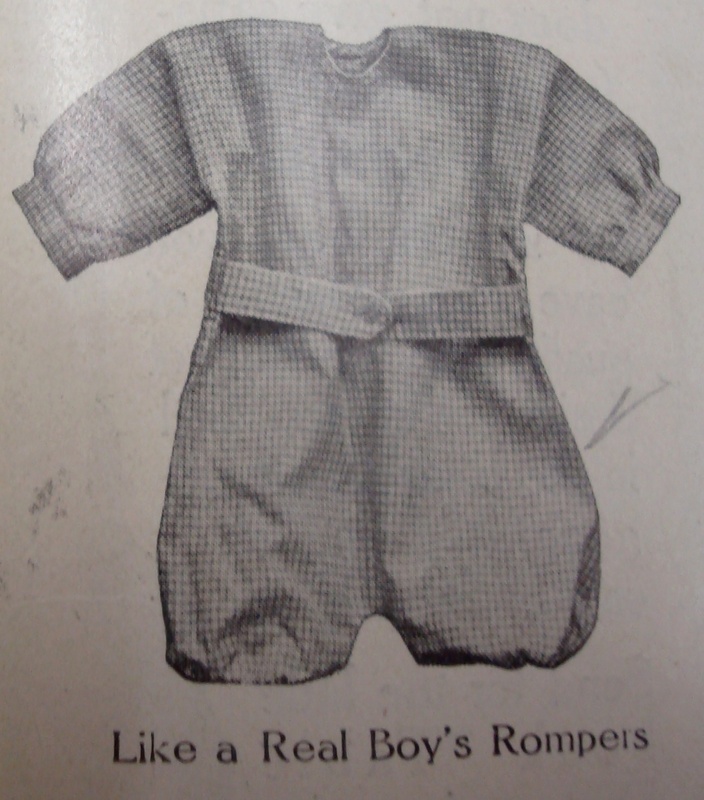 The raw edges on the inside are left unfinished so that the seam will be as flat as possible and there is no danger of chafing baby’s tender skin. One of the essential things that many amateurs neglect in finishing a garment is a careful pressing of all seams, as the garment is put together and also when it is a finished product. Many a garment loses that “homemade” look and assumes quite a professional air when treated to a good pressing. Monday, November 13, 1913: Am trying to fix one of my winter <missing word>. Wonder how it will turn out. I am good at doing awful sewing. I understand. I’m also good at doing awful sewing. I’m not a good seamstress because I’m not a careful sewer and tend to take shortcuts. Were you the same? Did you skip steps like basting? 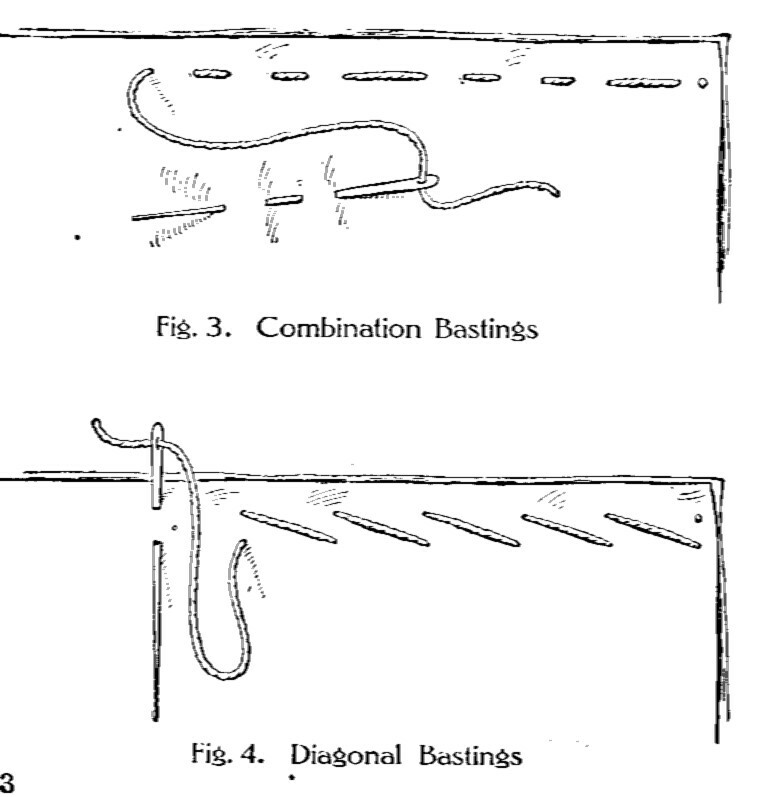 Bastings are temporary stitches used to hold two or more pieces of material together while putting in the permanent stitches. Careful basting is essential to successful sewing. There are four kinds of bastings. Diagonal Bastings are slanting and used in dressmaking to secure the outside material to its lining, particularly where the lining is eased on to the material, as is often the case in waist-making. The method is shown in Fig. 4. Sunday, December 22, 1912: Went to Sunday School this morning. Ruth and I went up to hear the Xmas services this evening. Twas tonight moonlit. Sounds like a lovely day—and a walk home in the moonlight sounds like a nice way to end it . Between Sunday School and the evening service did Grandma manage to find time to finish making last-minute gifts? . . perhaps some quickly made doll clothes for young people on her gift list. Both then and now, there’s a mad dash at the end to finish making gifts. 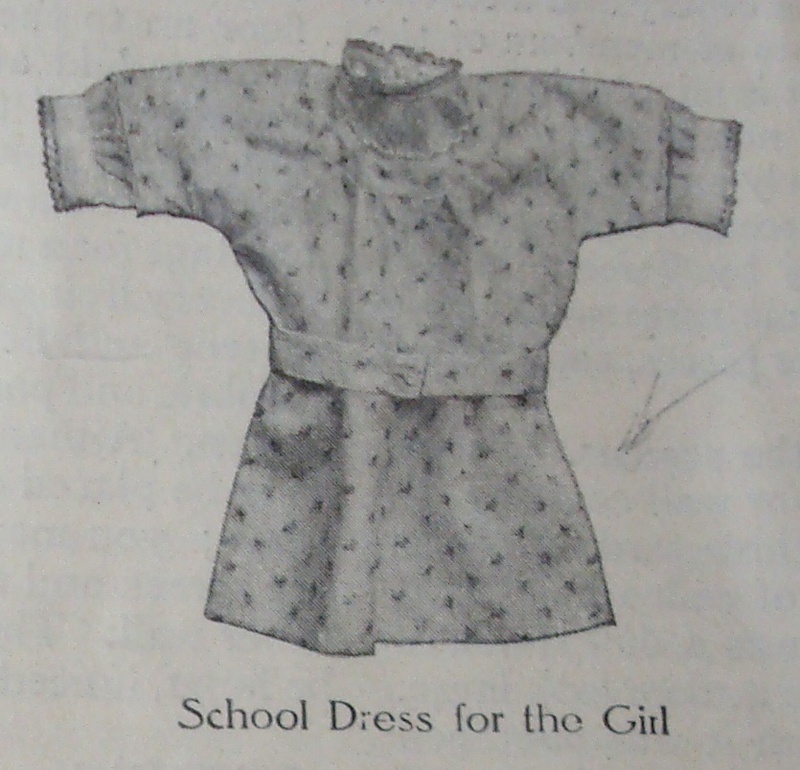 I found an article in the December, 1912 issue of Ladies Home Journal called “Quickly Made Doll Clothes” which featured outfits made from some patterns that the magazine sold. 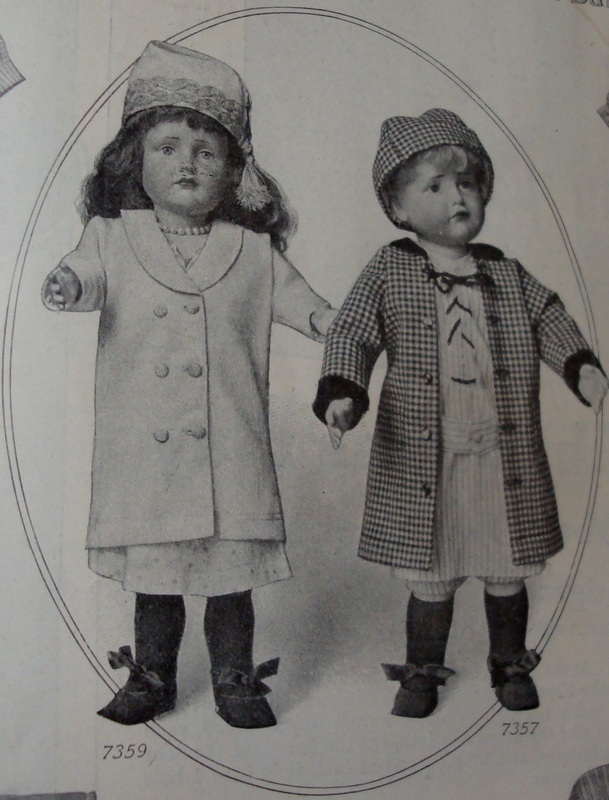 These quickly and easily made doll clothes should be especially welcome at this busy season, when the dressing of the children’s dolls is generally a last and hurried task. 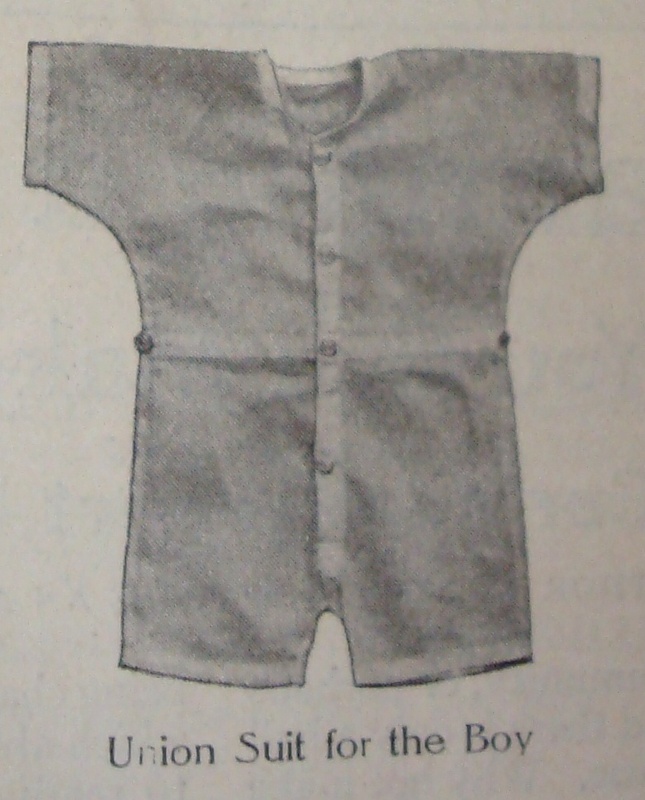 All the little clothes both for the girl and boy dolls have been cut from one piece or kimono shaping, thus eliminating the difficult making and adjusting of little sleeves, and each garment has few seams and may be cut from a very small piece of material. 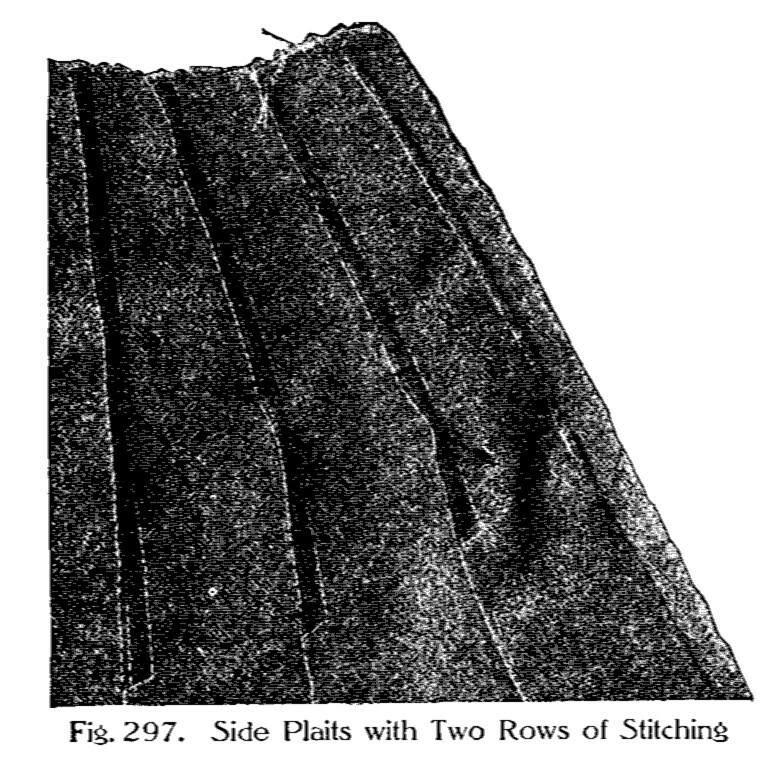 Monday, August 19, 1912: Did quite a bit of sewing today. You see I’m getting some of my things out of the way for when school starts. It rained like everything this evening. What was Grandma sewing? Maybe she did some hemming—of a new dress, or to remodel a hand-me-down and make it just the right length. 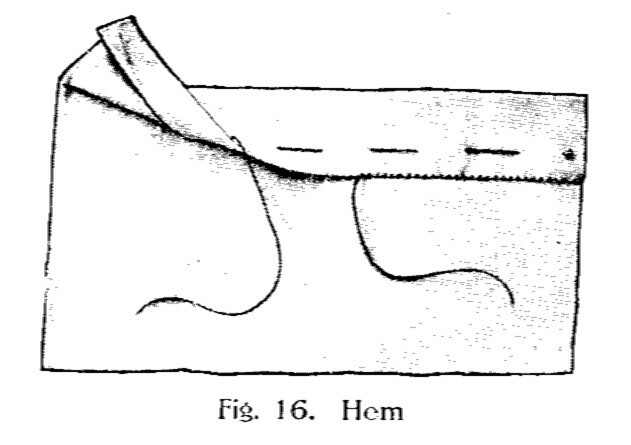 Here are directions from a hundred-year-old book about how to make a hem. (An aside: I had so much fun with the recent buttonhole post that I decided to do another post using the same book). 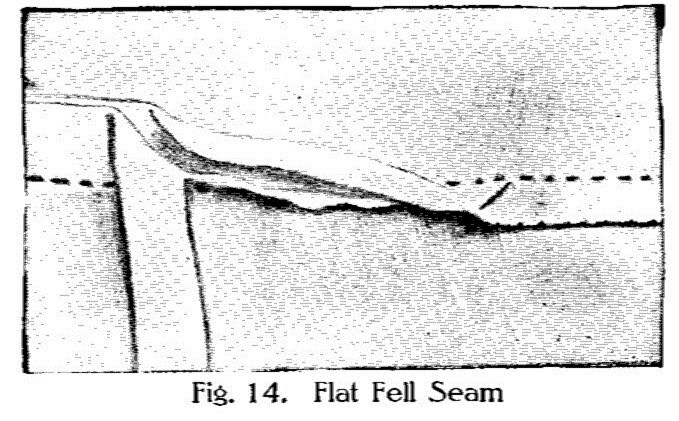 A hem is a fold made by twice turning over the edge of the material (Fig. 16). Make a narrow, even turning, and mark the depth for the second turning on the material with a coarse pin, chalk or basting, using as a marker a card notched the desired depth of the hem. Fold on the line, and if the hem is wide, baste at top and bottom. Hold the edges you are going to sew on, toward you; place the hem over the forefinger and under the middle finger and hold it down with the thumb. Begin at the right end and insert the needle through the fold, leaving a short end of the thread to be caught under the hemming stitches. Pointing the needle toward the left shoulder, make a slanting stitch by taking up a few threads of the material and the fold of the hem. Fasten the thread by taking two or three stitches on top of each other. If a new thread is needed, start as in the beginning, tucking both the end of the new and old thread under the fold of the hem and secure them with the hemming stitches. Train the eye to keep the stitches even and true. These directions seem awfully complicated and the drawing doesn’t look exactly right–but then, I guess that I probably couldn’t easily explain exactly how to tunnel through the cloth and then take a small stitch every half-inch or so. Friday, August 9, 1912: We had sort of s sewing bee here today. Besse was out and brought some of her stuff along. Besse was Grandma’s oldest sister. She was married and lived in nearby Watsontown. Was Grandma’s mother making buttonholes during the sewing bee? Three days prior to this post, Grandma wrote that her mother was making her a dress for school, and I posted hundred-year-old drawings of dresses with lots of buttons. Several readers commented that it would have been difficult to make a dress with that many buttonholes. 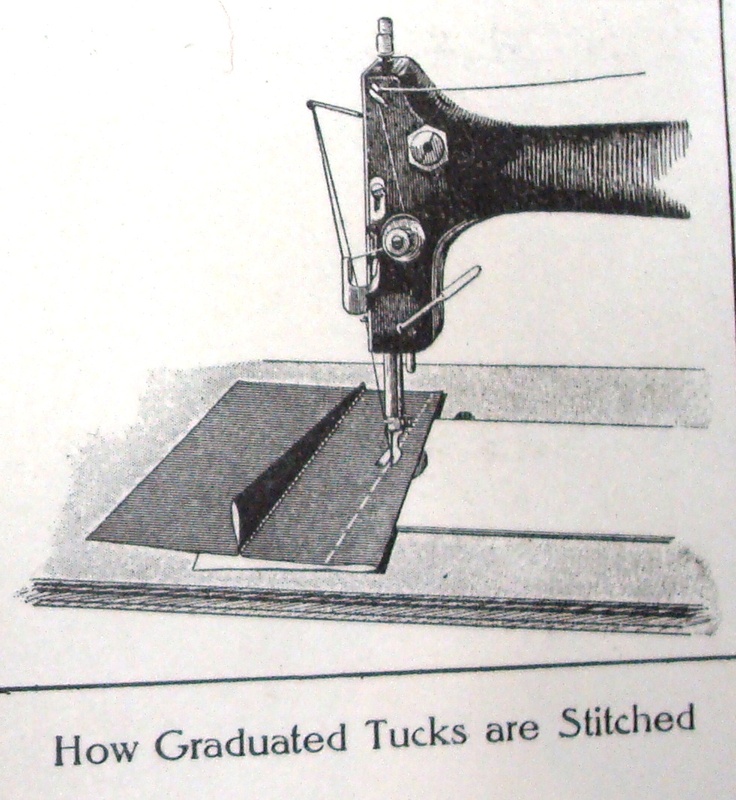 One reader noted that people didn’t need to make buttonholes by hand a hundred years ago because treadle sewing machines had an attachment that made them. A well-made garment that is otherwise perfect may be greatly injured in appearance by badly made buttonholes. They should always be properly spaced and marked before they are cut. Mark the points for the top and bottom buttonholes, and divide the distance between these two points into the desired number of spaces. The slit must be cut on the thread of the goods, if possible, and must be large enough to allow the button to slip through easily. With the buttonhole scissors carefully test the length of the slit and make a clean cut with one movement of the scissors. 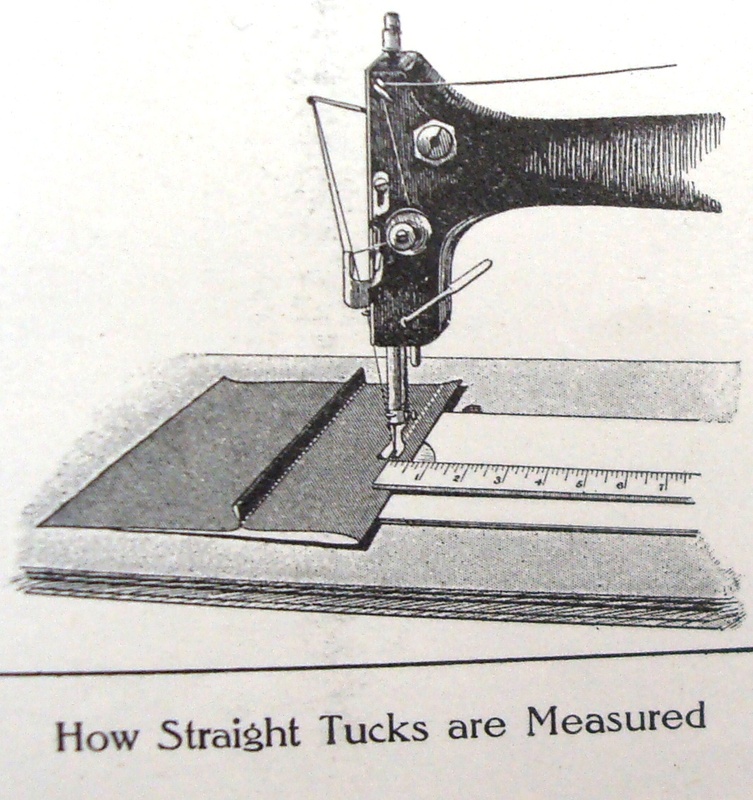 Barred buttonholes are used for underwear, waists and shirts. To make the buttonhole bring the needle up at one end of the buttonhole, and, allowing the thread to lie along the edge of the cut on the right side of the material, stick down at the opposite end. Do the same on the other side of the cut and stick down opposite the first stitch, with a stitch across the end to fasten the thread. If the material is inclined to fray, the edges may be overcast before working the button holes. To make the stitch, place the buttonhole over the forefinger of the left hand, holding it in position with the thumb and second finger as shown in Fig. 48. Begin to work the buttonhole close to the corner or starting-point. Insert the needle, and while it is pointing toward you, bring the double thread as it hangs from the eye of the needle around to the left under the needle. Draw the needle through the loop, letting the tread form a purl exactly on the edge of the slit. Continue these stitches to the opposite end, being careful to make them the same depth and close together. Now pass the needle up and down through the goods until two or three threads cross the end of the slit quite close to the button hole stitches, thus forming a bar tack. At the end, turn the work around so that the bar end is toward you and make several buttonhole stitches over the bar tack and through the material. Work the other side of the button hole and the second bar. Friday, June 7, 1912: I’m trying to make a skirt, but the end thereof is rather dubious. On June 3 Grandma mentioned that she was trying to remodel skirt that had been her sister’s. I assume that she was still working on it—and that it wasn’t going well. I wonder if she had any books or other resources to help her figure out how to alter the skirt. Tucks and plaits must be evenly arranged and the space between them must be the same. In skirts where few gores are employed, particular attention must be paid to the correct position of the lines, in order to keep the plaits perfectly even. The skirt must be joined to the waistband and the material between the plaits properly disposed, so that the plaits themselves will have a uniform appearance. Before stitching the waistband, the skirt should be tried on, and, if necessary, alterations made. It is then folded over the edge and hemmed down. A hem, two or three inches deep is the usual finish of the lower edge of skirts. Saturday, December 16, 1911: Mater is making a skirt for me. Had it fitted this afternoon. It is navy blue and am going to wear it to school. While doing a little bit of sashing, which took some rubbing this afternoon I had the misfortune to make four blisters grow on four fingers. One blister pains somewhat in hot water. It is rather hard on the dishwasher, who has blistered fingers. When using a pattern there must be taken up in each tuck or plait the exact amount that was allowed by the maker of the pattern. Patterns are perforated; that is, holes are punched through them at the points where the allowances have been made for forming the tucks or plaits, so that the goods may be marked at these points. 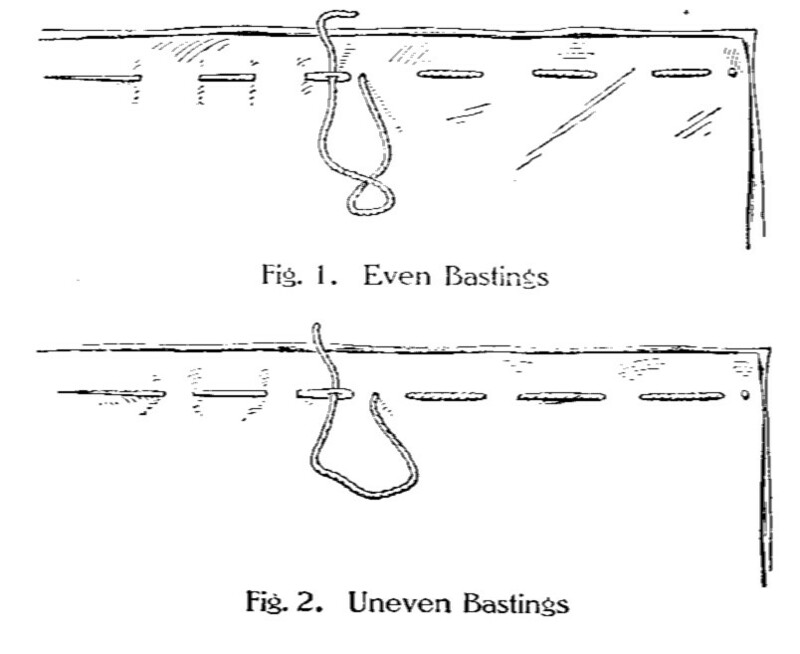 . .
Tucks and plaits that are marked by two lines of perforations which are to be brought together in forming are easily handled as follows: Lay the goods with the marks on the wrong side up, and put a pin from the under or right side of the good up through one point and down through the other, pinning the two points together. Proceed in like manner with the other points forming the lines, and you will have the fold securely pinned and extending on the right side of the goods. Baste of the right side of the goods in line with the row of pins, and try on the garment before stitching or pressing the tucks or plaits, for the tucks or plaits may be taken up or let out so as to make the garment conform to the shape of the individual. As forms vary so much in shape it may be necessary to take up goods in one tuck or plait and let out the goods in another, thus changing the shape of the garment but not changing the size.